There’s nothing I loathe more than painting. Wait. I take that back. Moving. Moving is the #1 thing in life that I refuse to ever do again. Usually the two go hand in hand. I am the world’s sloppiest painter. I always seem to get that brush roller mark thing on the ceiling. 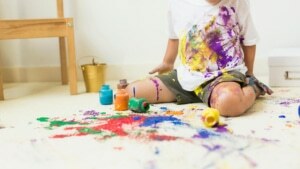 At any rate, we receive calls all the time from people who are just as clumsy as I, and end up spilling the paint on the carpet. Actually, I’m not even kidding, we got a call from a guy who was putting his house on the market, and spilled a can of paint on the carpet, and wanted us to come out right away to fix it. It was 5 o’clock when he called, but we came out right away anyway. There are a few tricks for removing paint stains on carpet. Paint drips on carpet are generally repairable by using paint remover chemical products we carry on our vans. Paint spills however, are a totally different ball game. We will typically remove the affected section of carpet where the paint has damaged the carpet and use either a leftover carpet remnant or closet section as the donor piece to make a beautiful carpet repair. If you live in a rental house or apartment, you probably will not have access to any leftover carpet remnants, so the best option will be to use a closet piece for the donor section and we will fill in the closet section with one of our non-matching carpet remnants we keep on our vans. Removing paint stains from carpet is our specialty.